Isn’t day five the day you always get frustrated? I remember this from my zen days, doing week-long meditations. Day five was always the day when I was in a bad mood. Day five, when you’re on vacation, and everything starts to become routine, and you notice the things that aren’t right. The first thing I notice today is that Sr. Maria is nowhere to be seen, and I need a driver to take me to the school. There is nobody today in the convent dining room who speaks English. Marsa has her few words, like “I like you”, and “You are beautiful,” and “We are happy to meet you.” But I want to know where Sister Maria is, and whether I can get a ride to the madrassa. They’re waiting for me, after all. Marleen said I could come every day. They’ll be asking what happened to me. I reach into my pocket for the phrases I’ve written down on a piece of paper. Ah, yes, there it is. “Where is…” Where is Sr. Maria? I ask Nagette. She points upstairs and mimics “sleeping” with her hands. Sr. Maria asleep at 8:30 am? I can’t believe it. I decide to go outside and look for Rohmy. I just saw him on my way to the convent! But now he is nowhere to be seen. I walk into the ornamental garden, looking for Rohmy. From my room, looking down, the garden looks beautiful. From inside, it is a mess. There is dirt and dust everywhere, the fountain seems to be broken, and there are little bits of garbage lying around. There is only one chair in the garden, and it appears to be filthy – and broken. There is an abandoned washing machine in the middle of the path. Why doesn’t anybody maintain or fix the things that are broken? One of the things I notice here is that there is a lot of sitting around. Women sit on benches outside the hospital and wait for someone. The steps of each floor of the hospital are so crowded with people sitting, sometimes I can hardly wriggle through them to walk downstairs. Why don’t they sit on the chairs in the waiting room? And it’s not that much different with the workers. They seem to have plenty of time on their hands. The other day, a doctor in the ER had enough time to show me the entire complex. Yesterday, Aowny told me that life is hard in Egypt; people have to work twenty-hour days to support their families. He told me he has to work from 9 am until 10 pm every day. Yes, he was on duty. But he also had a few hours to sit and chat with Sr. Elleria and me. On my second day here, the lock on the door to my floor of the hospital broke completely. The door is metal, and the lock as well. Some of the metal on both the door and the lock appears to be rusty, and screws are loose on both sides of the lock. I was unable to lock the door. Behind the door there are offices with valuable office equipment. It took me two days of asking Sr. Maria before someone actually repaired the lock, and then only from one side. I have found that if I use the key to pull on the door, I can get in and out once I’ve unlocked it. But why doesn’t someone repair the entire lock? I know that new stairs for the convent are being built, but why is there sand everywhere? Why don’t they pave the parking lot instead of leaving the sand there and letting it blow over everything? This morning, since neither Sr. Maria nor Rohmy is anywhere to be found, I have plenty of time on my hands. How to fill this time? I decide to clean my room. But I don’t know how. There are no buckets anywhere, no mops, no dustpans, although I have found a broom. I don’t know how they clean rugs here, and my rug is full of sand. The floor is coated with a film of sandy dust after having lived here for five days. I ask a girl in the office for someone to help me clean my room. I find a girl in one of the offices. It turns out we have already met. I should remember her, because her name is similar to mine – Shereen. Almost sounds like Noreen. But I have met so many people, I can’t remember her well. Marleen, Sabreen, now Shereen. I apologize. She smiles and says it’s okay, and that she will send the cleaning lady in a few minutes. Soon the cleaning lady arrives. I show her the bathroom with the broken light bulb. I tell her the other bathroom stinks, but even I can’t smell it any more. Have I gotten accustomed to the smell, or is it truly better, after I have poured at least two liters of water down the drain? I don’t know. But the cleaning lady won’t let me do a thing. I learn that there is no vacuum cleaner here, so the cleaning lady simply replaces my rug with one in another room. She cleans the floor, the toilet, the shower, the sinks. There are two things that will not happen. She will not let me clean my room myself, and the light bulb will almost certainly not be replaced. As I stand around, watching her work, I feel like a bossy colonialist. I am embarrassed. But after decades of sacrificing my needs to others, and years of working on myself, I have learned that I need to take care of myself and my needs, and that self-consciousness will lead to only more inhibition. As I write, I think I sound like a spoiled, petulant Westerner who thinks her culture is superior to this one. True, there is a strong perfectionist streak in me. One thing about learning to express my wishes and needs is that I think I have gotten bossier and more dominant than I was when I was compliant and submissive. So be it. I have also learned that God loves me as I am, and that I am allowed to be a bit bossy if that is the only way I can find to have my needs met. As long as I think I’m being reasonable, it should be fine. I wish the Egyptians would let me clean my room myself. I wish they could see and wish to replace broken light bulbs and fix smelly drains. I think they see, and yet they don’t see. Germans love the friendliness of Americans, but I doubt Germans will ever be known for their friendliness. I know the Egyptians long for a country that works better, but they don’t seem to know that they have be on the look-out for what needs fixing, and then somehow get working on it. But maybe this is too much to expect in a country, in a continent, that is known for being laid back. On my way to lunch, I pass a truck with two very old, dilapidated wheelchairs on a sort of platform in the back of the truck. A man sitting on a wheelchair is sitting inside the belly of the truck, and two men are trying to repair two wheelchairs that look beyond repair. I remember something Mohammed, Peter’s and my tour guide on our last trips to Egypt, said: “Egyptians will salvage anything.” Maybe the washing machine in the garden is also awaiting repair. Who am I to judge? I also learn that Sister Maria was indeed not sleeping. She left the convent at 6 am today, and was relying on another sister to bring me to my work. The other sister and I never met up. No matter, Sister Maria has found work for me in the school here in the compound for this afternoon and evening. I’ve just spent three hours working with the children, and it is wonderful! They are so friendly, so eager, so polite. 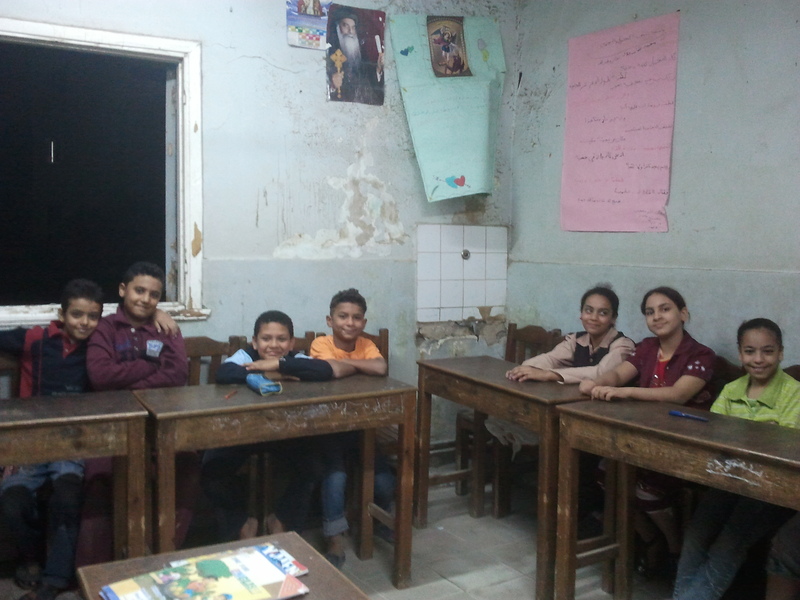 Their teacher, Reda, allows me to do most of the work teaching the class. He’s unbelievably humble, asking me how he’s doing as a teacher. What I see is a really loving man who loves his kids. Love is what comes across to me the most in this entire center. I see love wherever I go, whether in the hospital, the schools, or in the convent itself. Reda tells me that even though these kids are weak, he doesn’t hit or punch them. The fact that he is telling me this makes me wonder how many teachers in this country hit their pupils. “These kids are my brothers and sisters,” he says. I never had a teacher who called us students his or her brothers and sisters. I have to revise what I said about Egyptians not working very hard. It is nearly 8 pm and Reda is still teaching. He got up at 4 am today to teach in another school, taught there all day and then came to this school to teach in the evening program. He’s there every evening, five days a week. He has to take three buses to get to this school, and he often gives private lessons as well. Sometimes he only gets four or five hours of sleep because he has to work so hard. “I’d come here, though, even if they didn’t pay me.” What would make a person miss out on three hours of sleep, just to be able to work there? This must be a very special place.